Trade Less. Day traders with audited track records of long-term outperformance are like yetis: Maybe they exist but I’ve never met one in the wild. The more you trade the more you pay in taxes and commissions, which creates a high hurdle for outperformance. Studies show that trading volume is inversely correlated to returns, which is a nerdy way of saying that trading is hazardous to your wealth (VIEW LINK). A recent study (VIEW LINK) showed that the median day trader had lost 36% over the past year and that 80% of day traders had lost money. 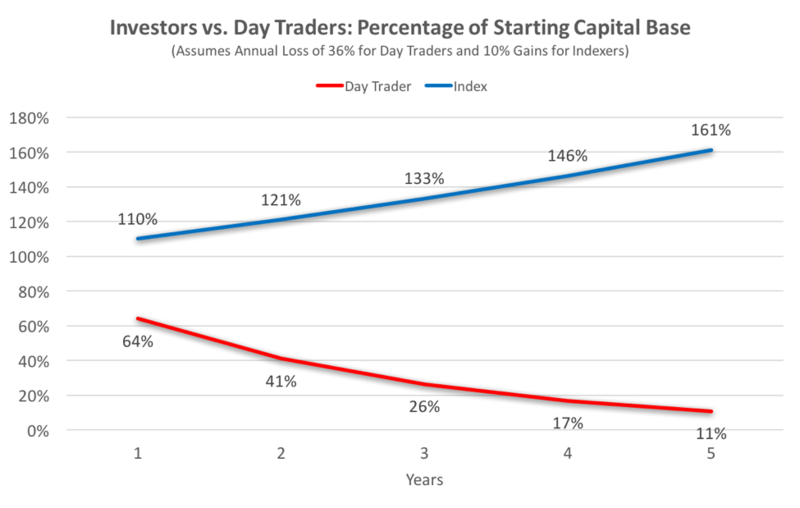 A typical day trader compounding their losses at 36% a year would have lost 89% of their money after 5 years, while a typical index investor earning would have gained 61%. That’s right: In this very real-world scenario, the capital base of the index investor would be 15 times larger than a day trader after 5 years. Don’t Hug Your Benchmark. The less your portfolio looks like your benchmark, the better your odds of outperformance. Both Morningstar (VIEW LINK) and Antti Petajisto (VIEW LINK) found that managers with high active share consistently outperform closet indexers. Morningstar found that only 22% of closet indexers outperformed their benchmarks, which isn’t too surprising considering the manager is basically layering an active fee on top of a passive strategy. As the nun from Game of Thrones would say, shame (VIEW LINK) ! Introduce Small-Caps. Small-caps’ outsized performance over the past year has captured the imagination of Australian investors, though the small-cap premium (VIEW LINK) is hardly a new phenomenon. Their long-term outperformance makes intuitive sense because smaller companies' shares don’t receive much attention from brokers, fund managers, or the financial media. 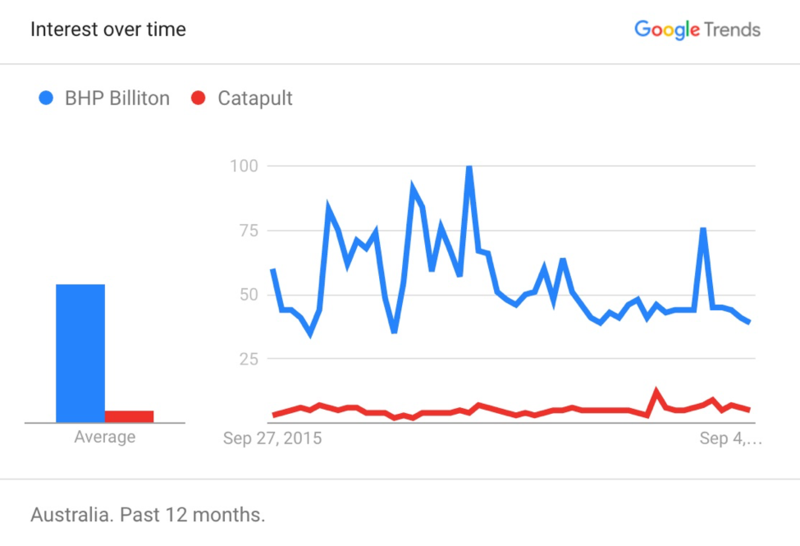 For example, let’s get a sense of investors’ interest in reading about Catapult and BHP Billiton via Google Trends. Keep in mind that BHP’s shares are down over the past year while Catapult’s are up a huge 141%. For that matter, Catapult has only been mentioned 6 times in the Australian Financial Review over the past 90 days, while BHP has been mentioned 136 times. It makes sense -- BHP’s market cap is 203 times larger and the AFR covers what its readers care about -- but it also shows just how little attention smaller companies receive. One more thing: Small-caps tend to be more volatile, but they also bring valuable diversification benefits to top-heavy portfolios that are stuffed with a handful of widely held banks, miners, and retailers. Nice icing on top of the returns cake. Back Founders. No one cares as deeply about a business and its mission than its founder, and their passion flows through into real outperformance. Researchers at Purdue University found (VIEW LINK) that founder-led companies generate 31% more patents than those led by professional managers. 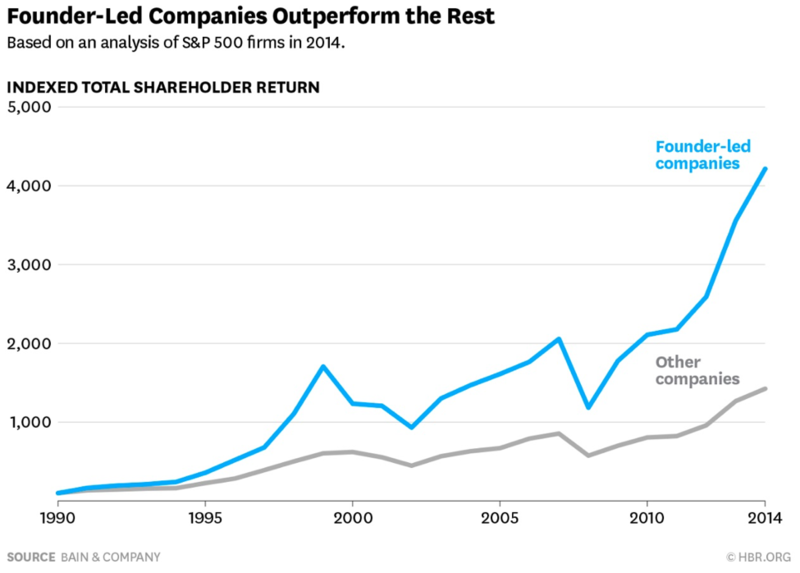 It gets better: Both Bain & Company (VIEW LINK) and the University of Washington (VIEW LINK) have shown that shares of founder-led companies significantly outperform those of other companies. Sell Your Losers. It stings to lock in a loss because doing so snuffs out the hope that the shares might recover. Hope is not an investment strategy, though, and most catastrophic losers never come back. A study (VIEW LINK) by J.P. Morgan found that 40% of stocks suffered losses of 70% or more from their peaks, and the average eventual fall from the peak was 60%. It shouldn’t be too surprising -- stocks that fall 70% usually have some kind of tectonic fundamental problem -- but it’s worth highlighting that, on average, catastrophic losers stayed losers. Concentrate. I’ve never seen much appeal in putting capital behind, say, my 31st best investment idea. Too much water ruins a Scotch, and too many holdings ruin a portfolio’s chance of beating its benchmark. The decision to concentrate is as well grounded as it is intuitive. Multiple studies, including from Brands et al. (VIEW LINK) and Goldman et al. (VIEW LINK), found that more concentrated portfolios tend to outperform. Bottom line: You can slice and dice the data all kinds of ways, but the value of a typical fund diversifying into dozens of positions is highly overrated. Own Your Decisions. The fewer cooks in the kitchen, the better the returns. Funds run by a single manager outperform those with multiple managers, according to Goldman et al. (VIEW LINK), getting worse with every manager added. Why? The researchers found that portfolios become less concentrated with each manager added, which likely reflects a shift towards consensus thinking, plus there’s greater accountability when only one manager has their name on the door. Keep it Simple. I love deep research as much as the next obsessive investor, but I also respect that each little nugget of information I pick up is worth less than the last. In fact, doing too much digging can be counterproductive. Joel Greenblatt showed with his ‘Magic Formula’ (VIEW LINK) approach that a simple two-factor model portfolio based on only earnings yield and return on capital would have delivered an annualised 30.8% return over a 17-year span. Basically, buying high-quality companies at down-at-out prices is a market-beating strategy. The logic is intuitive -- who doesn’t like quality at a good price? -- but it’s amazing how many investors try to overcomplicate such a simple premise. Don’t Overthink the Macro. Investors like talking about macro and it’s fun to pretend you’re George Soros. But you’re not. Yes, the GFC proved that even the crustiest bottom-up stock pickers can’t stick their heads in the sand when it comes to macro, but respect the difficulty of nailing macro calls. Ever notice that you rarely read about the track records of widely-quoted economists? Malkiel and Sata (VIEW LINK) found that, when it comes to repeating success year to year, Global Macro ranked next-to-last among 11 different hedge fund strategies. A more conventional Long/Short Equities strategy fared much better, plus posted better returns. Stick to what you’re good at (and it’s probably not macro). What Did I Miss? Let me know in the comments section! Contributed by Lakehouse Capital (VIEW LINK). This article contains general investment advice only (under AFSL 400691). Great stuff Joe, thanks for sharing. My nominations would be: 1) Focus on the long term; 2) Don't follow the crowd; and 3) Invest in what you know. Be collaborative; figure out who has good ideas and ask them what they are buying. Thanks Joe, very insightful. I think self-awareness and knowing one's behavioural biases plays a huge part in the process too. beautiful article which succinctly puts useful insights across with relevant citations.